The Erickson BIG BED is the perfect addition to any vehicle with a 2" receiver. Now you can haul large loads safely. Our Big Bed will extend a pick-up box another 48". With the 3 tie-down anchor points you can now haul that long load safely. Adjustable to work with any bed height. Conveniently folds and has a carry handle for portability. rated Rated at 400 lb. for an evenly distributed weight. Perfect for the canoe, plywood, drywall, a work station or a tailgate party. The uses are endless. 3 Locations to tie load. This tire is specially designed for towing, the stiff sidewalls will help prevent your trailer from swaying, ensuring a smoother ride. The bias-ply offers greater load capacity and additional stability when travelling on the highway. Give yourself and your loved ones peace of mind by being prepared for the unexpected. Dont end up stuck on the side of the highway, always carry a spare! This REESE Towpower<sup></sup> towing adapter converts a 7- way blade connector to a standard 4 or 5-way flat connector. It features highly visible, cool blue LED circuit tester for instant completed circuit confirmation. Not only can you adapt the trailer to vehicle fast, but you can be certain the connections are correct. The REESE Towpower<sup></sup> 4-way flat complete connector loop is designed to handle basic lighting connections on small trailers. It features 18 gauge bonded wire. Both the vehicle and trailer 4-flat connectors are moulded onto the wire to reduce corrosion and wiring time. The 24 Ft. of 4-flat wire is bonded to further ease installation and reduce the wire becoming knotted during installation. Ideal for rewiring a trailer and offering a clean professional looking job in the process. The Big Bed 48-inch Pick-Up Truck Bed Extender The Erickson BIG BED is the perfect addition to any vehicle with a 2" receiver. Now you can haul large loads safely. Our Big Bed will extend a pick-up box another 48". With the 3 tie-down anchor points you can now haul that long load safely. Adjustable to work with any bed height. Conveniently folds and has a carry handle for portability. rated Rated at 400 lb. for an evenly distributed weight. Perfect for the canoe, plywood, drywall, a work station or a tailgate party. The uses are endless. 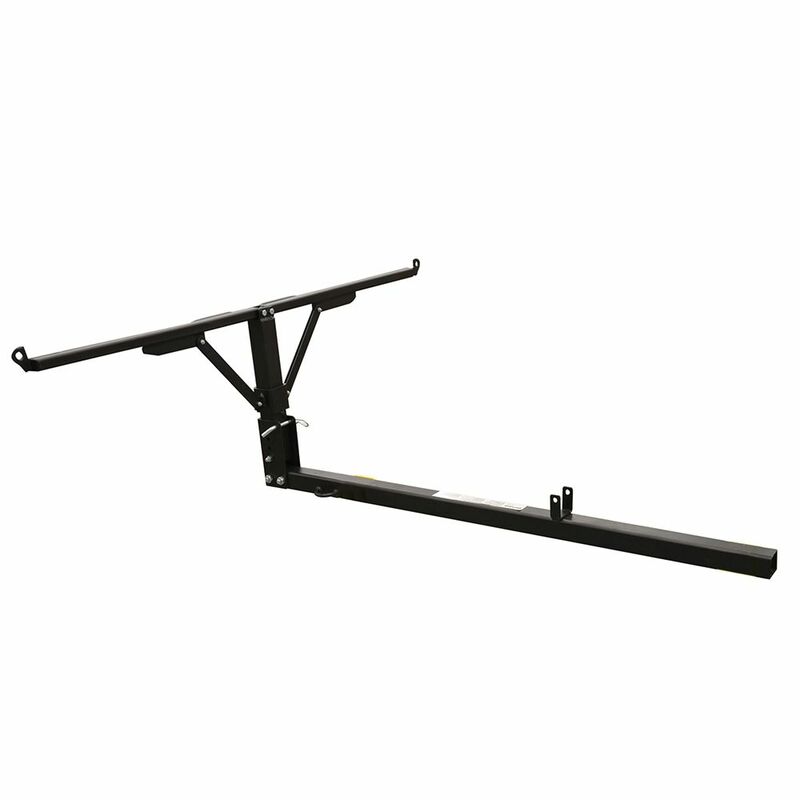 The Big Bed 48-inch Pick-Up Truck Bed Extender is rated 4.8 out of 5 by 12. Rated 5 out of 5 by partyneverends from Product was as expected. It is sturdily built and serves it's purpose. I bought it on sale as a "... Product was as expected. It is sturdily built and serves it's purpose. I bought it on sale as a "Special Buy Of The Day" and it has proven to be worth the money. Rated 5 out of 5 by Mario from Was easy to assemble and is very sturdy. ... Was easy to assemble and is very sturdy. Rated 4 out of 5 by storz from Hope to use it soon. Looking forward to using it soon. Should fix a problem I have had since buying a short box pick up truck. Rated 5 out of 5 by Cresh from Well made easy to use and works great. Well made easy to use and works great. Rated 5 out of 5 by HomeDepotCustomer from Well made,easy to assemble and handle. Well made,easy to assemble and handle. Rated 5 out of 5 by Bob from It works great and it was at a great price... It works great and it was at a great price too! Rated 5 out of 5 by David from looking forward to loading some lumber and having it totally... looking forward to loading some lumber and having it totally secured in my truck. Fits my 2" receiver hitch very well and the height adjusted to the bed height easily.